Any time you travel on or off road, compressed air is a vital component. VIAIR, or "Vital Air" is a company that specializes in 12 volt, portable air systems. In the past we have relied primarily on smaller 12 volt portable air compressors that can be purchased for very little money and usually complete with a battery or simply plug into a cigarette lighter etc. Lately we've been carrying an air bomb as well to give us the ability to store and transport compressed air. Although this has worked so far, sort of..there's always a better way to get the job done, and this is it! This thing dwarfs the smaller compressors we've used in the past giving us MUCH more air on command. When shopping for a 12 volt air system there are a few things to look for. The first is probably duty cycle. The duty cycle is how much time the compressor can safely run within a given period of time, expressed as a ratio. For example, a common duty cycle for compressors is 50/50, meaning that the compressor motor can run about half the time it is supplying air to your tools, filling tires etc... 50 minutes on and 50 minutes off. During the "on" time, the motor is pressurizing the tank. During the "off" time, your tools are running on the air stored under pressure in the tank. If your tools are draining the pressure off too fast, the compressor must run at more than a 50/50 rate which can lead to overheating and significantly shorten compressor life. The next thing to consider is CFM(cubic feet per minute of output at a given tank pressure). If you're going to run air tools, a good rule is that the compressor should exceed the CFM of the largest tool by 1.5 times. Most 12 volt systems won't supply the air needed to run air tools sufficiently, but will for short periods. The main purpose of the 12 volt systems in the off road environment is usually to inflate tires...and run air tools for short periods. If you are going to put the compressor on a rock crawler, you'll probably end up running it with a smaller tank or no tank at all in which case CFM becomes very important..unless you like waiting a long time to fill tires after a trail run to get back on the highway, make repairs etc. Of course, the more CFM and duty cycle, usually the more cost. When CFM goes up, the amps the compressor will draw also will go up. The above pic is a picture of the compressor and all the parts that we decided on for our project. We already had a 5 gallon tank, the compressor is a 350C that produces 1.48 CFM, with %100 duty cycle! It only draws 17 amps and has a max working pressure of 150 PSI. Expect to spend somewhere between $200 and $300 for a setup like this without the tank. Even though the pressure switch will turn the compressor on and off, it's a good idea to have a manual override to disable the compressor when not in use. Unless the system is completely sealed the compressor will run when not needed draining your battery etc. I went ahead and purchased a mounting bracket from VIAIR and welded it on. The pressure switch we bought will turn on at 90 PSI and off at 120. There are many options available depending on your needs and wants. This compressor came with the option to mount the filter remotely. I decided that it sure couldn't hurt to have the air being drawn in away from the heat of the motor, cool air means a cooler running compressor. Make sure the filter is in a place where it will be dry at all times. I welded the brackets for the tank above the batteries. Here's some shots of the finished product. Like I said, I already had the tank, but it was a good place for my free sticker. You can see the fittings here with the safety pressure relief valve, air gauge, output quick-connect and drain valve. The pressure switch is behind the gauge. The system works great! It filled this tank from zero to 120 PSI in around 5 minutes! We'll need to make sure to take enough hose to reach all our trailer tires and tow vehicle tires, and of course we'll be able to air up or repair any of our off road toy tires with ease from camp. Since we always seem to be playing with compressed air with air rockets too, this will ensure an endless supply whenever we need it...assuming the batteries are charged. We will still need portable CO2 cartridges for the trail and we'll probably still keep the air bomb in the trailer for back-up air that can be taken away from camp if needed, but we'll be able to fill the bomb up in a hurry with this! This sure will be nice. The kids will love the endless rockets! Happy Fathers Day! That looks like a great install. Very tidy. How much air does that tank hold? Thanks Shell and Sus. It's a 5 gallon tank..I still need to tidy up the wires a bit:) I have an ammo box that I want to mount next to the batteries to hold air hoses, fittings etc. as well. It is a good option. Thanks for the information. I would like to share info about one more equipment that can be very helpful for traveling. it is a 12v car fridge. This fridge is very easy to install and more easier to maintain. this can keep the food and drinks fresh and cool just like in home. 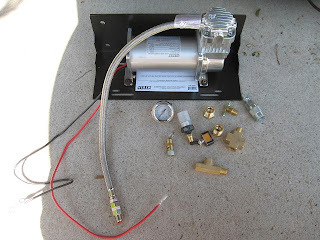 Very instructive post, the first air compressor I ever installed was at my old high school car, I've come a long way since then, I plan to specialize on that.